In all honesty this was a difficult and laborious listen for me from start to finish. I don’t mind Jazz and ethnic elements to tracks and indeed some of the music I listen to flirts with these genres on many an occasion. However, a bumper 2 CD package of nothing but obscure and off the wall music from one of the most revered artists in this scene, is a little too much to swallow in its entirety; and I found myself staring into space, slack-jawed and drooling like I was auditioning for ‘One Flew Over the Cuckoo’s Nest’ at the half way point. There are elements to The Ex that I love, with the odd smattering of anarchistic Punk floating my boat on the odd occasion; but it’s the incorporation of Free Jazz and other collaborative efforts that sap a lot of their work for me (although this does appeal to their wide and varied diehard fans). This album would have benefitted from tracks such as ‘State of Shock’ and so forth and most likely it’s the choice of songs on this release that leaves me a little cold. However, if you are one of the fans I mentioned above, who adore and revel in anything this legendary Netherlands act produce; then there is much to shout about here. Two compact discs of music, with a booklet packed with photos, posters and an article penned by Dutch journalist Peter Bruyn. The Ex though, if I am to be honest, have never really done anything for me, with only the odd album I can relate to; so I may not be the best person to ask when it comes to their music. But I do respect them non-the-less for their staying power and tip my hat to their ever loyal fanbase. 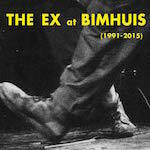 This entry was posted in Bimhuis, Dense Promotion. Bookmark the permalink.